With AMBOLOVE AC1200Mbps USB WiFi Adapter, you will own the latest and most powerful Wi-Fi technology_802.11ac. High transmission speed guarantees that there is seamless and lag-free when HD streaming, online gaming and other bandwidth-intensive. You can create a hot spot with the soft AP feature if your computer is under wireless internet connection. In Station Mode, you can boost wifi signals to your mobile devices from your computer, like a little "router". 1. Please install the driver first, then plug the wifi adapter into USB port. 2. Don't let the wifi adapter work for a long time to avoid burnout. 4. Any doubts or problems please feel free to contact us, we'll always be happy to support you. ☆ Transmission Rate: 1200Mbps, 2.4G/300Mbps+5.8G/867Mbps. ☆ WiFi Antenna: High Gain Long-Range 5dBi Antenna. 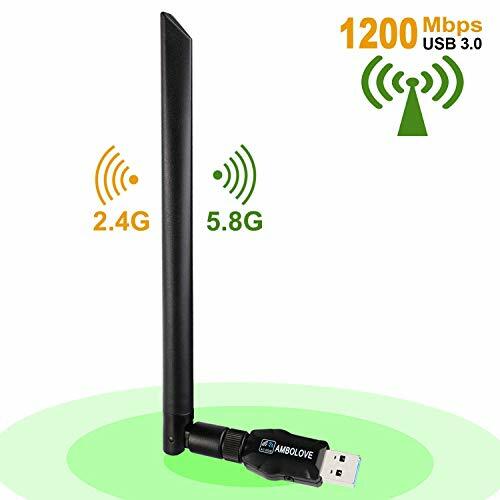 ☞ CLICK "ADD TO CART" NOW FOR THE BEST 1200MBPS USB WIFI ADAPTER & ENJOY THE GREAT NETWORK! ✂ AWESOME 1200MBPS HIGH SPEED: The latest and most powerful wifi technology - 802.11ac is up to 1200Mbps wifi speed on 5.8GHz/867Mbps or 2.4GHz/300Mbps band. Of course, it is also backward compatible with 802.11 a/b/g/n wireless standards products. Own it, your life will be more eaiser. ✂ AWESOME USB 3.0 INTERFACE: Many adapters can only be used on USB 2.0 port, however USB 3.0 supports transfer rates of up to 5Gbps which is 10 times faster than USB 2.0. AMBOLOVE wifi adapters works well with USB 3.0 and are also backwards compatible with USB 2.0 and 1.1 devices. ✂ AWESOME 5DBI ANTENNA: Small size package but with strong 5dBi antenna (not just 2dBi or 3dBi antenna), providing omni-directional wifi connection. It's tested that we can get full potential of our wifi connection form the living room to the bedroom, and the connection will not be interrupted. ✂ AWESOME WARRANTY AND CUSTOMER SERVICE: AMBOLOVE TEAM has been in business for over three years and there are a lot of repeat customers. Rest assured that we will offer you the same guarantee and support as before. Any doubts please feel free to contact us, we are more than happy to provide you with best service.